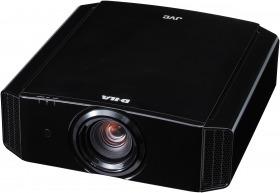 New JVC DLA-X3 & DLA-X7 3D Projectors now on demonstration! Just arrived! The amazing new 3D projectors from JVC. These are all new models and not a revision of the previous units. Now that we've had a few hours to play with them, what makes these so so special is that the image looks amazing straight out of the box, a VAST improvement over the HD550/HD950 from last year. This is especially relevant on the base model, the DLA-X3 as, as with the HD550 before it, it has no CMS (colour management system) for full isf calibration which was a feature of the HD950 and the new DLA-X7. However, the gross colour oversaturation of the old models has gone so they look absolutely gorgeous, straight of of the box, BRAVO JVC! Contrast ratios are significantly up on last year's models too at 50000:1 and 70000:1 respectively. Oh, I nearly forgot. These models are of course full 1080p 3D. Although 3D can look quite impressive on a 50'' plasma, it's nothing compared to a 7-8' projection screen. This is REALLY how 3D should be seen and for a limited period, JVC are offering 2 sets of glasses and the 3D transmitter absolutely free. So there we have it. A JVC 3D 1080p projector with 2 sets of glasses and a transmitter for just £3599.95. That's just £100 more than the HD550. Stunning! And don't forget, until end of January we have our winter sale on so you can save 10% on these prices. That makes the DLA-X3 just £3239.95!! !